Events in Tunisia `historic’…not just for country, but already for the region and possibly beyond. On the other hand, it has been described as somewhat `unusual’ for Tunisia suggesting that social movements there rarely exist and people rarely demonstrate..
– Eg – There has been `social unrest’.. so to speak almost non-stop since early 2008 – that is for three years that began in the Gafsa mining district town of Redeyef in which most of the same themes that fueled the recent social movement had already taken shape: high unemployment, corruption of the country’s leadership and finally, pervasive political repression..
– The whole country, from the poorest of the poor to many who from an economic point of view have been quite comfortable, participated. 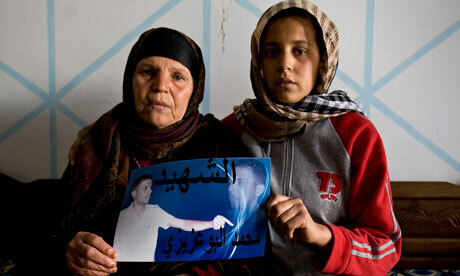 The protests emerged from deep within the country, Tunisia’s heartland and soul. This you can read about now pretty much everywhere, and while details need to be explored – it is mostly true..
Not only did the United States support Ben Ali, but also gave him the U.S. foreign seal of approval by labeling the regime `moderate’… a label that is both misleading and that will come back to haunt Washington. the U.S. war on terrorism. 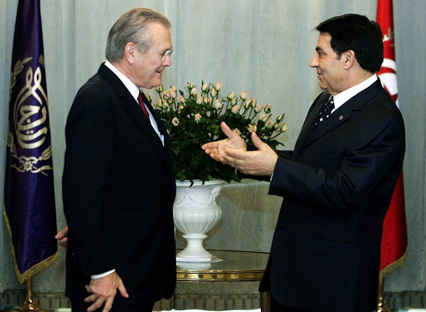 The Ben Ali Regime cooperated and participated in the Bush Administration’s extraordinary renditions and some Tunisians acted as interpreters in Afghanistan. There is Tunisia’s larger role in military alliances with NATO, Africom. Will this continue? Is this why the United States let security considerations trump its support for democracy? 2 The role of World Bank and IMF structural adjustment programs and how these contributed to the overall economic decline of the country needs to be fleshed out, and explored, starting with and not limited to the way the Ben Ali and Trabelsi families took advantage of privatization programs to create their own private empires. These themes are important because they lie at the heart of U.S. support for Ben Ali’s regime, for the decades of American silence concerning what they have long known to be a system long rotten. A lot of this is excellent. Some typos of course like an interesting double comma followed by an ellipsis. One thing that has to be changed immediately though is the Tunisian translators in Afghanistan. Tunisians speak Arabic, not pashtun man! I assume you mean to say Iraq. We should talk more, I am really glad that you are connecting well with the Tunisian community and you are getting speaking engagements. I am going to have to do some more writing myself… I do too much reading.